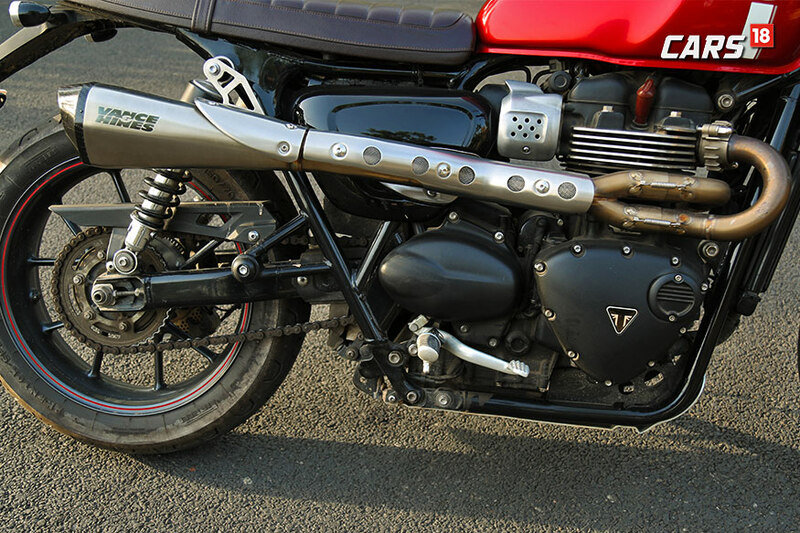 Retro motorcycles have a charm of their own and the Triumph Street Twin manages to encapsulate that in an exciting way. When it comes to Retro motorcycles then there’s hardly anyone who does it better than Triumph. Their iconic Bonneville range of motorcycles is a testimony to that fact. 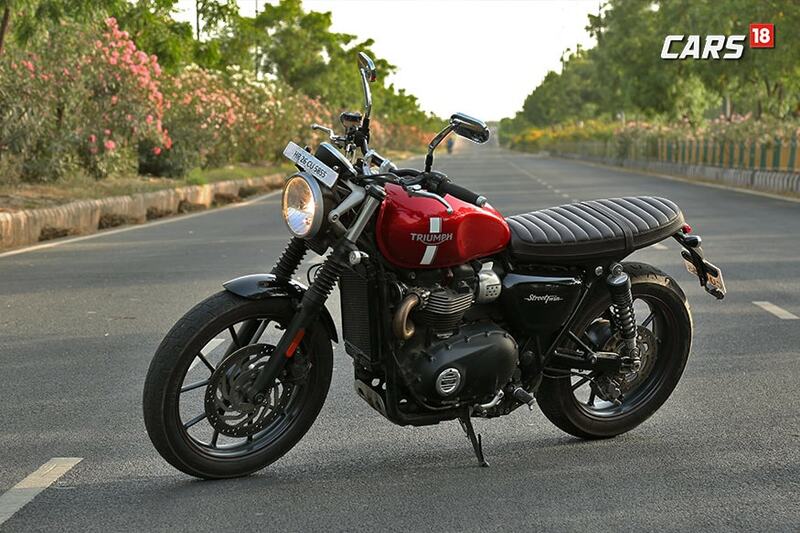 Even in India, the Bonneville range accounts for the maximum sales by Triumph and the Street Twin is your most accessible way into the Bonneville family. Usually, getting your hands on something iconic or something that you know would stay iconic even after years of ownership is an expensive affair. But, since the Street Twin comes with a competitive price tag of just Rs 7 lakh (ex-showroom, Delhi), could it make for one of the best value for money retro motorcycles right now? Let’s face it, one of the biggest attraction points with retro motorcycles is style and the ‘stand-out’ factor that comes along with them. In this regard, the Street Twin scores full marks. On top of that, our test unit came equipped with the ‘Scrambler Inspiration Kit’ and the wonderful Vance and Hines exhaust, making it such a looker. Looking like a modern motorcycle in today’s time is not that difficult but keeping the modern bits while looking like it belongs to the 60s, well, that’s rare and it’s there in the Street Twin. The round headlamps, the slim fuel tank and the large 18-inch wheels at the front make sure that it lives up to the Bonneville in its name. While at first glance, the bike may or may not make you go ‘wow’ – depending on how you feel about retro motorcycles – but trust us when we say this, the Triumph Street twin will grow on you and slowly make its way to your list of prettiest bikes out there. It takes a minimalistic approach to design and it works, even the graphics on the fuel tank are all that there is and don’t look forced or out of place. The clock shaped instrument cluster is also a nice kickback and comes with an integrated digital display which shows everything you need to know. 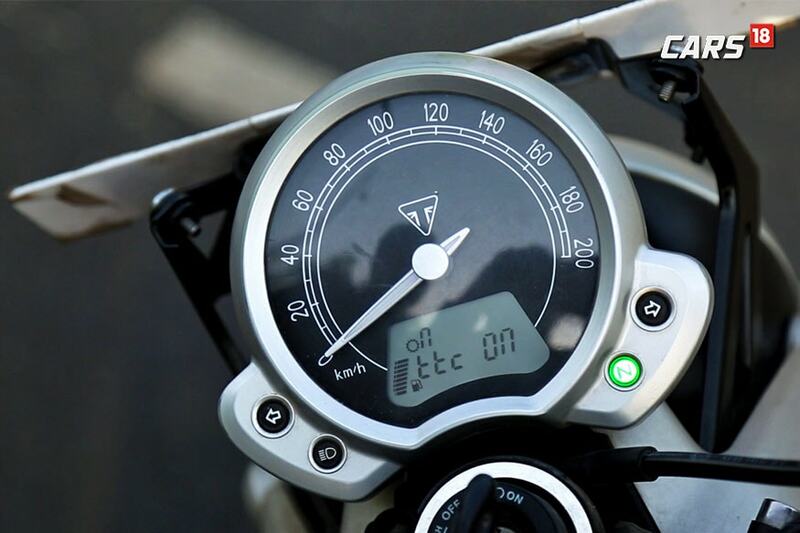 It also allows for easier operation of the bike’s electronics with through a scroll button on the handlebar. 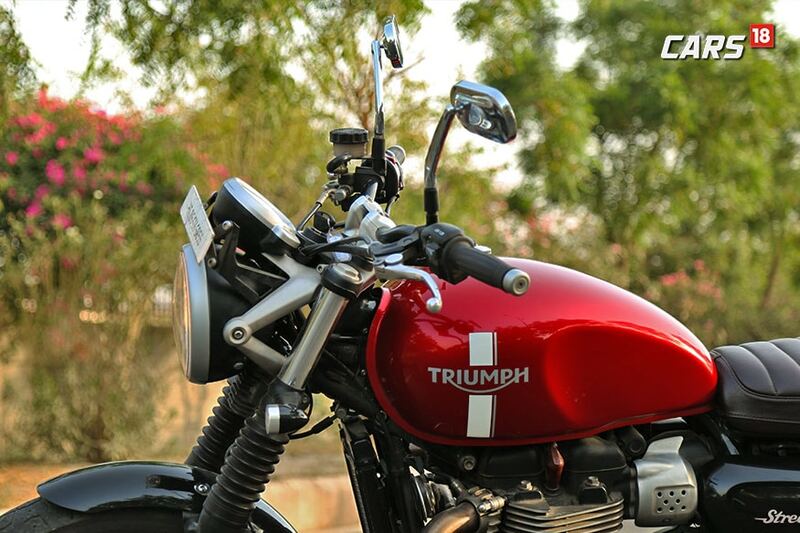 As for the built quality, Triumph mostly nails that part and it has done it even with this one. Once you are done drooling over the way it looks, a new side to the Street Twin appears – it is as equipped with features as its ‘modern’ counterparts. Hidden underneath that skin is ABS, ride-by-wire, switchable traction control, an engine immobiliser, under-seat USB charging port and the engine on board comes with fuel injection and liquid cooling. 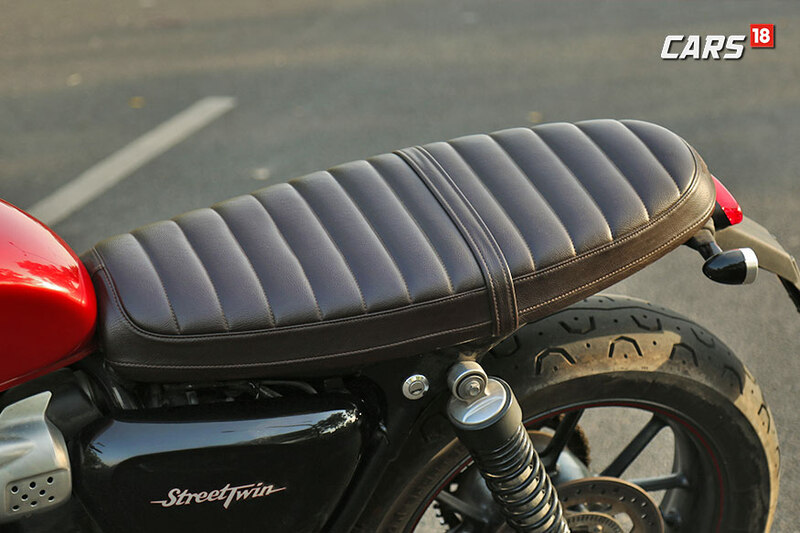 One key element that’s commendable about the design is just how neatly the radiator is tucked in, making it tricky to spot it right away, especially if you don’t know that the Street Twin has liquid cooling. This, in turn, does not take your attention away from the classic styling elements of the bike – something that the purists will appreciate. The other big positive of the ‘Twin is the practicality it offers. The large 18-inch front wheel and a suspension travel of 120mm, both front and back, helps it swallow potholes with ease. 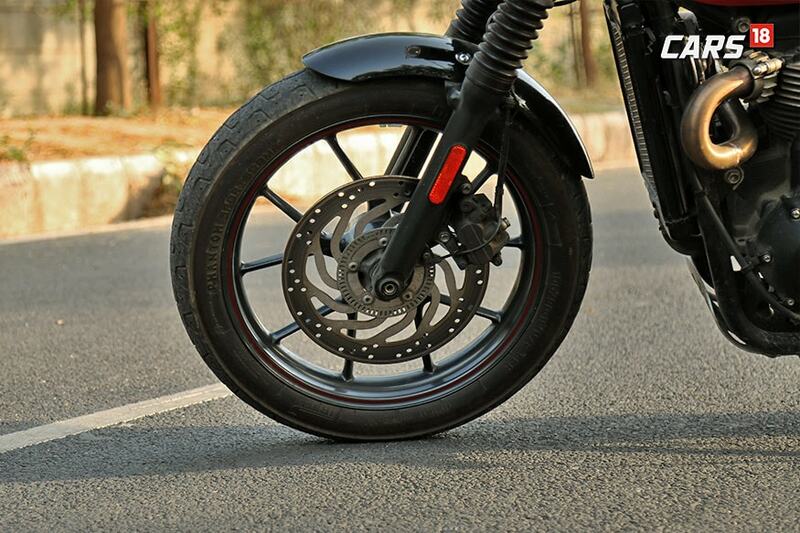 The suspension may seem a bit soft at first, especially if you are used to riding performance-oriented motorcycles, but it is nothing short of ideal for city road conditions. The ergonomics are relaxed as well. The foot peg positioning isn’t aggressive, which, when coupled with the high handlebar and the low seat results in a very relaxed riding position. While the handlebar is high, you only slightly have to reach out to the handlebar which gives the rider a bit of a dominating stance as well. Oh, speaking of seat height, it is quite low at just 750mm. For reference, the Honda Navi has a seat height of 765mm! Hence, even short riders will find it easy to plant both their feet on the tarmac even when the bike is stationary. The 900cc engine delivers 54 horsepower which, interestingly, is less than the last generation Bonneville. The torque, on the other hand, is 18 percent more at 89 Nm which is delivered as low as 3200 RPM. This makes the bike feel spirited during those quick bursts of speed and you will never be left wanting for more. The 5-speed transmission isn’t exactly ‘quick’ but it slots into gears with ease and you won’t have any false neutrals or gear shift misses. The bike is not perfect, though, as there were a few things that we wished were better, like the brakes. Despite having a large 310mm single sided disc brake with Nissin callipers, it lacked feedback as well as bite. The mirrors on our bike, which were accessories and not stock mirrors, were also pretty much useless. We wished it had taller and wider stems and a larger glass area for better visibility, or any visibility, perhaps. Hence, we would recommend sticking to the stock ones that are provided by the company at the time of the purchase of the Street Twin. This particular part, though, is not so much a negative as it’s more of a characteristic of the motorcycle. Since the riding position is relaxed with the high handlebar and the foot pegs are positioned low and closer towards your knees, you won’t exactly be going corner hunting on the Twin. The 198 kg weight (dry) of the motorcycle doesn’t help either and makes it feel a bit lazy. The chassis, though, is so much more capable – a cue for those looking to customise their Street Twin. The Triumph Street Twin’s biggest competitor in the Indian market is the Ducati Scrambler which gets quite similar specifications and is also in the same price bracket. Other than that, it faces internal competition from the vast range of Bonneville offerings in the family, but keep in mind, that all of them are priced higher than the Twin. All things considered, it is evident that when the Triumph designers took to the drawing board they had a very clear idea of what they wanted the end product to be and knew their target audience very well. Those who would be buying this bike are most likely not looking at extreme off-roading, track days or across the continent road trips. What makes it different from other motorcycles in this segment is the kind of everyday usability and practicality it offers. On top that, Triumph says that it can be a very good starting point for those looking to customise their motorcycle and hence, are offering over 150 accessories so that you can have it custom-tailored to your taste. But is it worth the Rs 7 lakh (ex-showroom, Delhi) price tag? Well, let’s put it this way. On paper or at first glance, or even maybe for the first few kilometres, you may or may not think that it’s worth it. But, when after a year of ownership you realise that the bike was probably fit for riding for well over 300 days, then the Street Twin will make for great value for money.